La maison où j'ai grandi a été démolie. The house where I grew up has been demolished. La ville où il habite a beaucoup de charme. The town where he lives is very charming. Here où simply means where and introduces an action taking place in a previously mentioned location. Le jour où il a gagné le match. The day (when/that) he won the game. La semaine où ils sont restés à l’hôtel s’est vite terminée. L’époque où il vivait était dangereuse. The era (in which) he lived was dangerous. The era he lived in was dangerous. 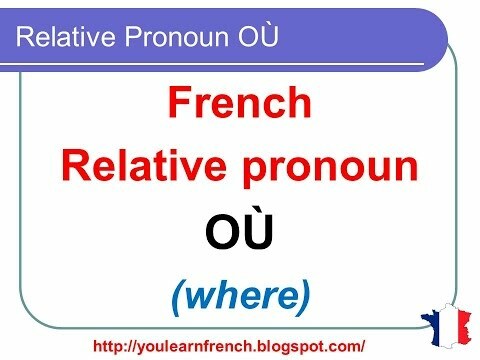 In sentences where the relative pronoun introduces actions taking place during a previously mentioned time frame, you will also use où to express when or that/in which. Note that you cannot omit the où the way you can the when/that/which in English. You can never use quand or que in this context! When used in a question, où always means where? and quand always means when? Où vas-tu ce weekend ? Quand vous êtes-vous rencontrés ? And the shadow dances near the fire. I had written 'dans lequel', but received a wrong answer. In reading the lesson, it stated that after a noun 'dans lequel/le' can be used instead of 'où'. Why is 'où' the only answer here? "Où" in French can be used to translate "Where" or "When". Is it that pronom 'où' is followed by a noun or subject pronoun? As seen in above examples. In my last post, I was concerned about the use of t’ before a. Should it not be s’? it is "l'année... a beaucoup plu à toi", so the 'te' is used. I can't work out what this means in English. The year ... rained a lot for you? Surely not. How would you translate this, please? "Cela m'a plu" doesnt mean "that has me rained" but rather "I liked that." (Literally: that pleased me). “L’année où tu as vécu en France t’a beaucoup plu." Here, as Chris said, it's the verb plaire in Le Passé Composé. "The year [...] you pleased a lot" -> the year [when you lived in France] pleased you a lot. Hi, do I understand it correctly that one always uses ou regardless of the tense? Like for example in "the day I will marry" or "today is the day I go skiing for the first time" or something like that? Bonsoir Mieke, So here is the reference part from the lesson with the examples: «Le jour où il a gagné le match. The day (when/that) he won the game. La semaine où ils sont restés à l’hôtel s’est vite terminée. The week (in which) they stayed at the hotel went quickly. L’époque où il vivait était dangereuse. The era (in which) he lived was dangerous.The era he lived in was dangerous. Note that in sentences where the relative pronoun introduces actions taking place during a previously mentioned time frame, you will also use où to express when or that/in which.» So to answer your question, the answer is no because «où» is only used in phrases that begin with a relative pronoun, in this case «où» and the subsequent action took place during a previously mentioned time frame. Example: «où il vivait était dangereuse» here is «où» followed by a verb in l'imparfait (historic action). This was preceded by this time frame: «L’époque» J'espère que ma réponse vous aidera. Bonne chance. Hi Ron, Thanks for your response. I am still a bit confused though. Initially I thought that one only uses “ou” when it refers to a situation that takes place in the past, because in the examples this is always so. But in the quiz the sentence Le jour ________ j'arrête de fumer, les poules auront des dents is used. That is why I thought that perhaps you can also use “ou” when a description in present or future time is concerned. So how would you translate “the day (that) I will marry? Thanks!